Combinations from 25" - 84"
Those who appreciate rounded forms will be charmed by the Elipse collection. 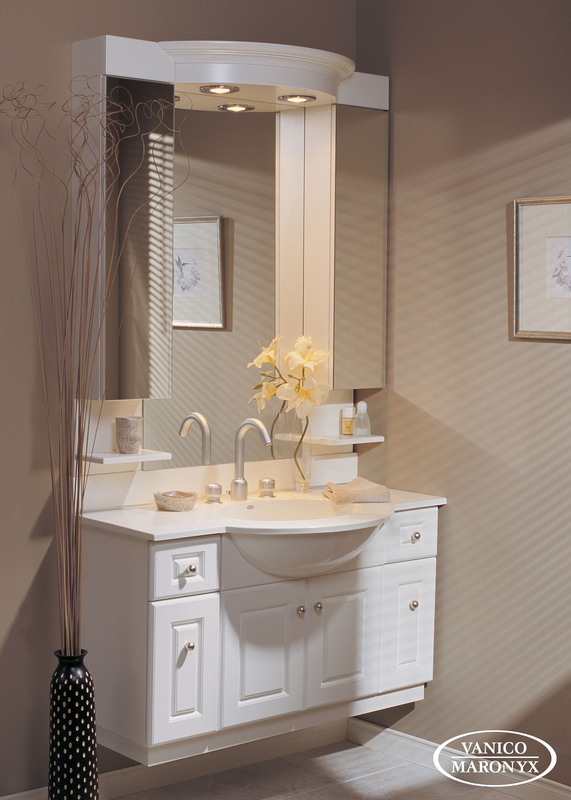 The curved sink and rounded lighting fixture reflect each other in perfect harmony. Doors and drawer fronts: Heritage Style in MDF Lacquer, Satin Vanilla Color (L-95). Vanity top: Polymer in Biscuit Unimar Finish (U-96). Doors and drawer fronts: Contemporary Style in Maple Wood Veneer Stained in Pear (E-16). Doors and Drawer fronts: MDF Maple Wood Stained in Maroon (E-19-O). Vanity top: Bianco Perle Natural Marble (M-BP). In perfect harmony with the furniture. Toe-kick adjustable to the floor gradient. Can accomodate a therapeutic air or whirlpool system. Side panels are removable to give easy access to the plumbing or therapeutic systems. Side panels can tilt-out to offer optional storage compartments. Great flexibility of layout to fit the wall positioning and the bathtub shape.